Mariah Carey’s twins wanted to surprise their momma on her 42nd birthday today. The singer tweeted that she was rushed to the hospital this morning for contractions but was released from the hospital. Nick was nervous about the labor room thing and today it almost happened. While the diva and Mr. Cannon were celebrating both her birthday and their wedding anniversary today, the twins almost made their grand entrance into the world. Mimi was rushed to the hospital in the wee hours of the morning when she started experiencing contractions. 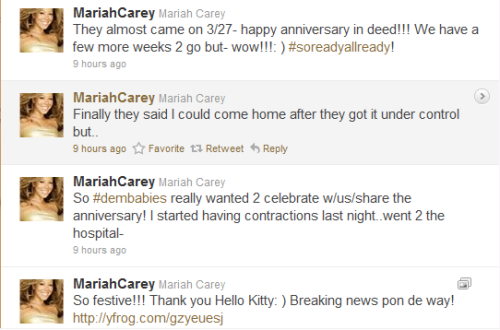 But once she was admitted, doctors got the contractions under control and Mimi was released.